Jandy Pro Series AquaLink RS systems enable total control of your backyard experience. 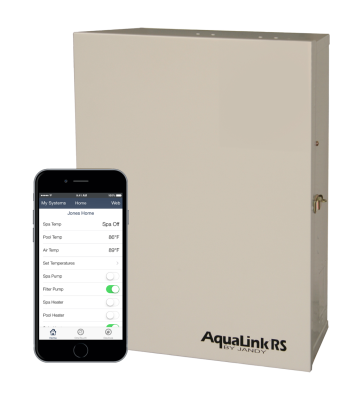 AquaLink RS systems are fully integratable with home automation systems, and feature our patented seasonal adjust technology, which can modify schedules throughout the year, for substantial additional energy savings. AquaLink RS delivers the ultimate pool/spa automation experience. Control individual pool and spa functions, lighting, and water features from the convenience of your home. Automate daily pool equipment functions, such as filtration, sanitation, and cleaning and create one-touch macros. The following products are optional interfaces that are compatible with the AquaLink RS System. The AquaLink RS All Button is attractively styled, easy to operate, and has a single line digital screen that displays temperatures, date, time, and equipment status. Convenient spa-side control for system control from inside the spa.